My old North Face backpack is looking pretty ratty after carrying my books through several years of schooling, and it has a few design issues that have only annoyed me more the longer I own it. I’ve also found myself wanting to buy local, to the extent possible, which rules out North Face for replacements. I also decided I’d like to give the messenger bag thing a try. I shopped both Timbuk2 and Chrome offerings, but the fact that both companies have offshored production of some of their newest models left a bad taste in my mouth. In the case of Timbuk2, the stores I checked (REI and Powell’s) didn’t seem to carry the US made models. I came very close to buying a Chrome bag made in California from the PSU Bicycle co-op, but remembered I still had an option that was even closer to home. 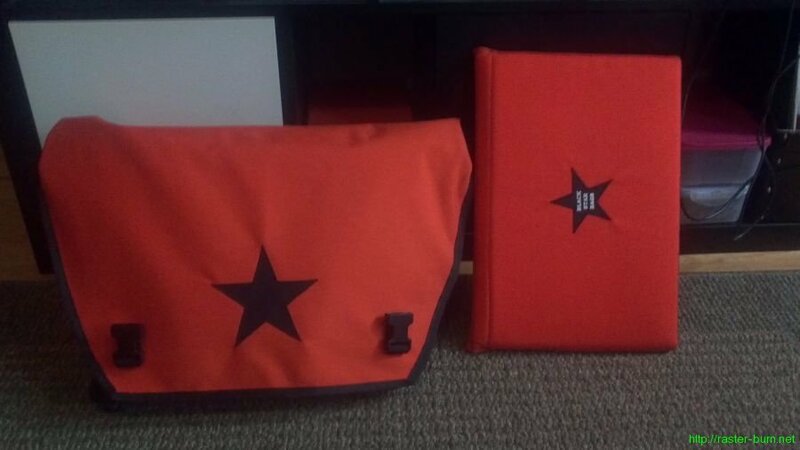 I’d heard about Black Star Bags a couple years back and have had their web site bookmarked but never paid their store in southeast a visit until last week. The location tucked into the building next to the Cinemagic theater on Hawthorne is pretty small, the showroom a tiny sliver of the space with the lion’s share of the room dominated by materials and sewing equipment. When I stepped through the door Dave greeted me and asked me if I was looking for anything in particular. I said I was interested in one of the medium messenger bags and he launched into an animated rundown of the features designed into the bags and helped me find the configuration and color I was after. $150 later I was the happy owner of a bright orange stock model (the very reasonably priced customization options were tempting though). I was surprised to find the pricing to be competitive with what the bigger players were charging for their US made products. I got to keep my money in Portland and it didn’t even cost me extra! I’m only a couple days into my ownership but I’m extremely impressed so far. I keep finding new touches that improve the useability of the bag and it’s super comfortable even with a quite hefty load (17″ laptop, some notebooks, cables, tools, and random other stuff). Having handled Black Star, Chrome, and Timbuk2 bags I think even if the Black Star bag was more expensive I still would have made the purchase, both for the appeal of buying Portland, and because of the tangible difference in quality of materials, workmanship, and customer service.